Most preschoolers and kindergartners can do some algebra even before entering a math class, a new study claims. yet, are doing basic algebra and with little effort,” said lead author Melissa Kibbe from the Johns Hopkins University. “They do it by using what we call their ‘Approximate Number System:’ their gut-level, inborn sense of quantity and number,” Kibbe said. The “Approximate Number System,” or ANS, is also called “number sense,” and describes humans’ and animals’ ability to quickly size up the quantity of objects in their everyday environments, researchers said. Humans and a host of other animals are born with this ability and it is probably an evolutionary adaptation to help human and animal ancestors survive in the wild, scientists said. 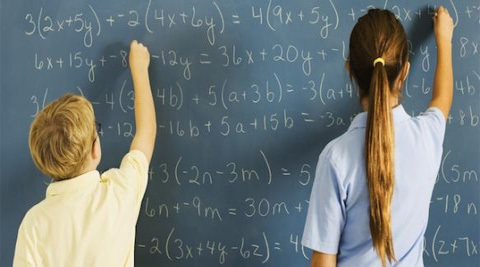 Previous researches have revealed that adolescents with better math abilities also had superior number sense when they were preschoolers, and that number sense peaks at age 35.
hidden variable. The answer was “yes,” at least when the algebra problem was acted out by two furry stuffed animals – Gator and Cheetah- using “magic cups” filled with objects like buttons, plastic doll shoes and pennies. In the end, the examiner pretended that she had mixed up the cups, and asked the children – after showing them what was in one of the cups – to help her figure out whose cup it was. solving for a missing quantity, which is the essence of doing basic algebra, researchers said. 3 Internet is the gen-next doctor!